After finishing my first entry for this competition where I almost missed the deadline.. I realised I had another whole month as the deadline was pushed back. So what better way to continue my learning than to build something for the other category using the Alexa Voice Service! Trying to wrack my brain for ideas.. I was inspired by the header image and decided to build my own time machine! OK so I'm not Doc and I didn't require any flux capacitors, but a soldering iron and 7 panel displays were involved. I decided to make an Alexa enabled alarm clock! As usual I had my Raspberry Pi 3 with WiFi goodness, I added a display using an Adafruit 1.2" 7 panel (banana for scale). "IO" - I2C bus voltage. We're in business! wow this thing is BRIGHT! I wonder if I can change that..
As the Alexa sample app we're going to use doesn't allow voice activation, I'm going to hardwire a switch. I have a simple push button purchased from here that I've wired up to a GPIO pin and a 3v pin which will be used to activate Alexa (more on that later). I grabbed the Adafruit library here on github and got to work making a clock. It's fairly simple, use python to get the time, format it and write them to the display all while blinking the colon. I had to add some try blocks because I occasionally get write errors to the display, but they never affected the overall functionality of the clock. Woohoo! it looks good. What else can I get this to do? hmm.. lets try the temperature! I found an awesome API at openweathermap.org where I can get some current weather data. Sign up for an API key, find my local weather ID and map the digits against the predefined hex values for the numbers and letters. The only thing missing from this Alexa alarm clock is.. Alexa! I began by using the Amazon Alexa AVS Raspberry Pi Project. The tutorial provided there is excellent so I won't go into how I installed it as anyone is free to follow those instructions. I did however make a few modifications that I will outline. Be sure to check out the link to his project above if you want to implement the push button switch. It's pretty straight forward. screen -S "nicksclock" -p 0 -X stuff "sudo -u pi /home/pi/nicksclock/alexa.sh$printf \\r"
This is a huge obstacle because as I said earlier, I can't VNC into my raspberry pi every time I reboot the device. I went in search of help and the amazon staff members on the alexa forums are outstanding. My thread is available here and the answer was to run your javaclient in companionApp mode instead of companionService mode, and use an Android or iPhone app to authenticate your application (once). Once you get this done you never have to authenticate your application again if you reboot. The full instructions on doing this is available here. It took some research and a post to the Alexa forums again to realise that I was probably starting the application before my networking was available on the Raspberry Pi (another thing fixed by moving the startup to systemd.. I promise I'll do that soon!).
! I fixed this in my own code, and it worked beautifully. I have not had an issue connecting to the LWA service since then. So what does any good developer do? Fix the code and submit a Pull Request of course! My PR is here on github and hopefully they'll merge it into their code soon. No device is complete without its own Alexa Skill, so I went to work on finding something I could add which worked well with the Alarm Clock. The majority of information in regards to setting up an Alexa Skill is available in my first entry. I ended up with "Nick's Clock" (no bonus points for figuring out why I called it that).. which greets you in the morning, gives you a weather update, gives you a news update and turns on your kettle, ready for the day! This skill borrows from this hackster project which explains very well how to get the WeMo working via a lambda call. Be sure to watch my video to see it in action! ...and go to modelling. This should do! When the print was done I installed the panel and the button. And we have the final result. Looks great if I say so myself! I've mentioned the majority of the issues I came up already, but I'd like to mention two issues I spent a lot of time battling with that I wasn't able to win. Both were related to the same thing: Audio. I built a speaker with a mini arduino amplifier and plugged it into the Pi. Soldering the speaker.. I really did make it! The issue is that it would constantly emit a buzzing/feedback noise. I tried a plethora of solutions I found on the internet and none of them worked. My speaker plugged into an iPod worked fine, and a different large Sony external speaker (that I ended up using for the project) worked fine as well, so I was really unable to isolate the problem. If anyone out there has any clue, please comment! My final solution is going to be to test this device tomorrow but I'm not sure how it will go. screen -S "audio" -p 0 -X stuff "sleep 30; echo \"connect 8C:DE:52:0C:B5:EC \nquit\" | bluetoothctl$printf \\r"
and the result of this? well.. java applications seem to require completely different code to output to a bluetooth audio device.. so I just didn't bother. It wasn't worth my time when a simple Sony speaker worked so well via the 3.5mm port to the line in port on the speaker. You can view my other published skill here. 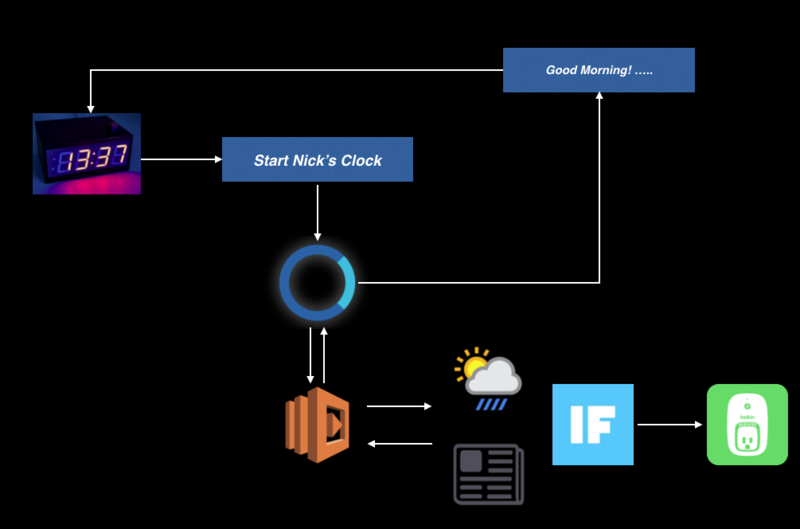 This was a fun, stressful and some times downright aggravating project, but I learnt a LOT about electronics, the Alexa Voice Service and improved my NodeJS skills when writing the Lambda part of the Alexa Skill. And learning is the point of these projects, so I would say it was a huge success! Thanks to Amazon, Eddie Hartman, and Simon Triantafillou.